Pope John math students were among the 1,523 students from 98 Nebraska schools who participated in the 26th annual UNL Math Day on Thursday, November 19th. The event is designed to spark high school students’ interest in math, to encourage them to pursue and career in mathematics or mathematical sciences, and to recognize outstanding mathematical ability. The day started with an individual multiple choice preliminary exam called PROBE I (Problems Requiring Original and Brilliant Effort). 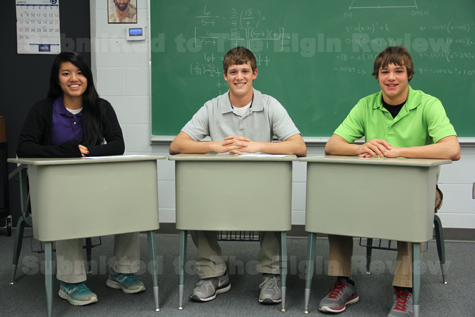 Pope John placed third in the small-school division in this event. The average of the three highest individual scores of a school is used in ranking. Scott Middle School and Spalding Academy outranked them. Tied for the highest Pope John score were Scott Moser and Seth Schumacher. Karissa Dicke was third, followed by Nicole Beckman, Terri Seier, and Jill Schindler. The top 40 students from PROBE I qualified to take the PROBE II exam. Scholarships totaling $34,000 were awarded to those who excelled in this event.